When it comes to knee replacement surgery, later is better. @NightshiftMD explains why. More than sixty thousand Canadians per year and climbing get knee replacement surgery. A U.S study published last week in the British Medical Journal finds that a good number of patients south of the border may be getting new knees before they need them. The study by researchers in the U.S. and the Netherlands looked at just under 4,500 patients with osteoarthritis of the knee and those at high risk of arthritis. They looked at the impact of knee replacement surgery on patients and the cost of the surgery to the system. Overall, each patient benefited somewhat from the surgery with better quality of life. For patients with moderate arthritis, the improvement was modest; for those with severe arthritis, it was substantial. 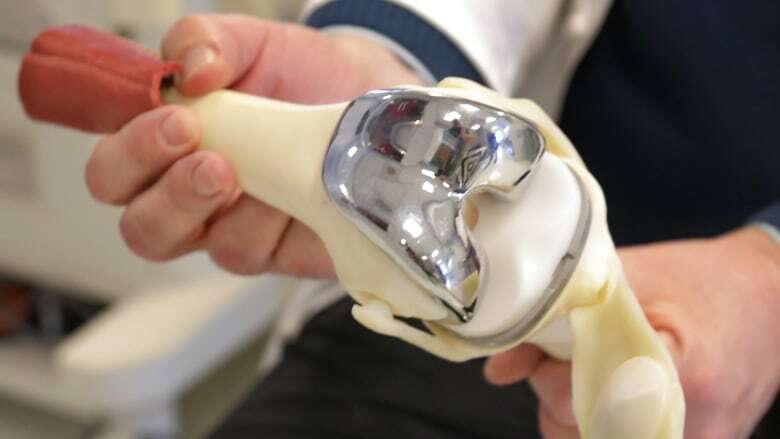 When they looked at the cost of the surgery plus hospital charges, they found that knee replacements were cost effective only in patients with bad arthritis. The authors concluded that knee replacement surgery should be restricted to more severely affected patients. This is a U.S. study. So you may be wondering how relevant the conclusions are for Canada. One Canadian orthopedic surgeon told me the study is spot on. Money is wasted on people who shouldn't have knee replacements and, many patients end up worse following surgery. Far too many need a second operation to fix problems that were caused by the original replacement, such as stiffness and instability of the knee – often due to surgery that should not have taken place. The Canadian Institute for Health Information tracks the rising number of repeat surgeries that are being done on Canadians who have new knees put in at a relatively young age. Surgeons who fix botched replacements surgery say the original surgeon replaced the knee even though the arthritis wasn't bad enough. Perhaps the patient complained of a lot of pain and the surgeon replaced the knee without knowing if replacing the knee would fix the pain. They say patients aren't being properly informed of the risks of surgery, and aren't being prepared for what they must do to recover from the operation. The provinces and the federal government have been more focused on wait times. Studies like this one have put outcomes and money wasted on the radar screen. Sunnybrook's Holland Musculoskeletal Program has developed an award-winning model of patient care. The Holland Program has centralized management and triage of all referrals for joint replacement surgery. Instead of an orthopedic surgeon handling referrals, that job goes to an advanced practice physiotherapist or APP. APPs have additional training in assessing patients with arthritis. They triage patients and refer them to the orthopedic surgeon only when there is objective evidence that that the patient needs a new knee. The APPs and the surgeons assess the patient's function, and use measurable criteria to score patients. Twenty-eight per cent of the patients the APPs see do not need surgery. Those patients get education on how to manage their arthritis. Patients can demand to see the surgeon, but that seldom takes place because APPs are good at what they do. At first, the orthopedic surgeons there were a bit skittish about the new approach because they were used to seeing the own referrals. Some were frankly afraid they'd lose business. Now, they love it when APPs assess and screen patients. Before, they had to sift out the patients who needed new knees from those who didn't, and they had to deal with patients who were disappointed that they weren't getting surgery. Now, they have confidence that when the APPs say a patient needs a new knee, they need a new knee. Like me, family doctors are just guessing who needs surgery; the APP knows. Fewer patients needing surgery means patients get seen faster and discharged faster. In my book, that's potential a win for every stakeholder. To me, the bottom line is that patients should not demand a new knee. Instead, they should demand an assessment of their arthritis that is both thorough and objective. You'll know it's both if you are asked a lot of questions about how you function at home, and if you are watched by the health professional as you walk and do other standardized testing. For my money, an APP is well qualified to assess you and to decide if you need surgery now, or if it can wait. Studies have shown that compared to physicians, APPs are just as good and maybe even better in diagnostic accuracy and the effectiveness of their treatment advice. APPs have also been shown to spend healthcare dollars as wisely and maybe even more wisely. Currently, APPs have started to take hold in Ontario. I think we need to see them right across Canada. Above all, do not be disappointed if you are advised that you don't need a new knee today. There is always tomorrow.